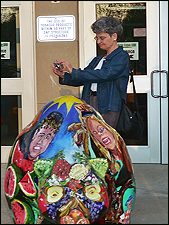 “Embraceable Bear” is the name given to this bear, a creation of Christine Burnley of Pottstown and sponsored by orthodontist Leonardo Galletto who maintains an office in both Boyertown and Pottstown. Healthy foods many healthy teeth and bright smiles…the message that “Embraceable” communicates clearly. 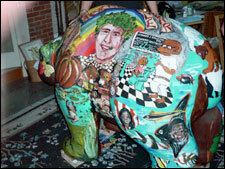 Likenesses of Dr. Galletto’s own children and Christine’s grandchildren grace this bear designed to make you smile too. 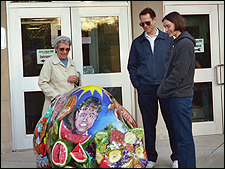 Ruth (lft), Jim (ctr) and Tara (rt) Petrowicz, Jane Stahl’s mother, brother and niece admire “Embraceable Bear,” the name given to this bear, a creation of Christine Burnley of Pottstown and sponsored by orthodontist Leonardo Galletto who maintains an office in both Boyertown and Pottstown. Healthy foods many healthy teeth and bright smiles…the message that “Embraceable” communicates clearly. 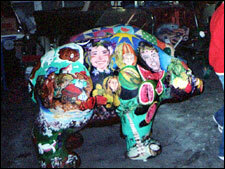 Likenesses of Dr. Galletto’s own children and Christine’s grandchildren grace this bear designed to make you smile too. Pat Petrowicz, sister-in-law of Jane Stahl, Bear Fever organizer, enjoys the favored sport among Bear Fever enthusiasts—photographing bears. Watching us is “Embraceable Bear,” the name given to this bear, a creation of Christine Burnley of Pottstown and sponsored by orthodontist Leonardo Galletto who maintains an office in both Boyertown and Pottstown. Apples as eye sockets are one of the many healthy foods that mean healthy teeth and bright smiles…the message that “Embraceable” communicates clearly. 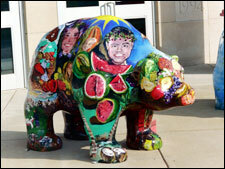 Likenesses of Dr. Galletto’s own children and Christine’s grandchildren grace this bear designed to make you smile too. The concept for the Em”brace”able Bear focuses on Dr. Galletto’s Orthodontist Practice and my love for toothy smiles and “Beary Tales.” My artwork often coincides with my real job as a Reading Specialist. Lately I have featured several of my students and, of course, my beloved grandchildren in renditions of candid photos. The bear’s fruitful face with cauliflower ears is to remind us that healthy teeth require a nutritious diet. Dr. Galletto’s son is crowned with a wreath of raspberries, and Shelby, my oldest granddaughter, is adorned with cornhusk hair. Two previous patients, Hannah and Elliot Christ are coiffed with eggplants, onions and broccoli. The posterior “beary” tales are familiar literary favorites. Embraceable bears a pyramid of Eric Carle’s Panda, Polar, and Brown Bears; Sister Berenstain visits the dentist; Paddington pals up with Alpha bear Amanda to work in their garden, but Sleepy Bear snoozes in his snowy cave. While Winnie the Pooh pops by with his pot of honey, a host of other grizzlies sneak into the picture. My youngest granddaughter Lila makes a charming Goldilocks and her brother Liam is a handsome Christopher Robin, don’t you think? You can tell that I cherish my friends, family and fictional inspirations. I have been inspired by a variety of connections between Impressionist artists, children’s literature, students, family members and far off places. Look for Van Gogh, Paddington and Starry Night. Note we go Over the Rainbow to Dr. Galletto’s. See the office blackboard reminiscent of the Berenstain Bears’ dentist visit. You’ll see Black Bear Cub Fishing and a multicultural connection with India, Africa and Puerto Rico. Can you recognize Cezanne’s apples? Or Monet’s lily pads? How about Gaugin’s coconut trees? See Larry Bear lounging in his hammock between mountain ranges (Swiss Alps perhaps) and cow pastures. But cows? Where did they come from?